In 2012, at the age of 32, I became pregnant with my first and only baby, a boy, due October 22nd of that year. At my 40-week doctor’s appointment, my obstetrician measured my baby at 8.5 lbs and recommended an induction for Thursday evening of the same week, despite my wishes for a naturally-induced labor, and despite the fact that I had been battling a terrible cold. I went against my gut and trusted her judgment. Fast forward to Thursday at 9pm. Adhesive arachnoiditis, the strangely-named, dreadful, incurable, painful, oftentimes progressive DISEASE with which I would later be diagnosed, was nowhere to be seen on the form. After reading through the consent form, I asked the nurse what was meant by “nerve damage.” She explained that a nerve could be nicked and that I might feel a numb spot for a little while. I recalled my birthing class, where the epidural was sold as “the safest method of pain relief for both mother and baby” – a procedure that finally ended the inhumane suffering that women used to have to endure during childbirth. I signed the form “just in case” and we started the IV, which began pumping my body full of Pitocin. For hours, I fought the progressively stronger contractions, my eyes closing between them, begging for sleep. Late the next morning, the contractions became unbearable. Not realizing at the time that I could have asked for the Pitocin to be turned down, I finally gave in and asked for the epidural. No other methods of pain relief were offered to me. My potentially life-threatening wish was immediately granted. When Dr. K, the anesthesiologist, came in, I could barely breathe. He asked me if I had any questions. Even if I did, it was impossible to speak in my state. I felt more reassured. As Dr. K advanced the needle, the contractions continued, hard, fast, and with just seconds in between. He then threaded the catheter through the needle and administered the medication. I immediately felt pain on my left side, and he asked me where I felt the effects. I answered that I felt it mostly on the left side. He then either reinserted the needle or repositioned the catheter. It remains a mystery, as neither was noted in the medical report. Oddly enough, immediately after the anesthesiologist administered my epidural, the nurse rushed to turn down the Pitocin drip, remarking how fast the contractions were coming. Why she didn’t do that before I begged for the epidural I will never know. Relieved, I finally slept for a couple of hours. My baby came at around 7 in the evening (at 7 lbs. 13 oz. Not the Goliath of a baby my OB had described). I was elated to meet my beautiful son. However, I became very worried at how weak my legs were when I finally stood up. I continued to voice my concern about the weakness and numbness in my legs for the next two and a half days, but the nurses kept telling me it was normal and that the epidural just needed some time to wear off. The anesthesiologist never came back to check on me during my hospital stay despite my complaints. On Sunday, my husband, my mom and I left the hospital with our newborn in the back seat. I still felt like I had a mini epidural. 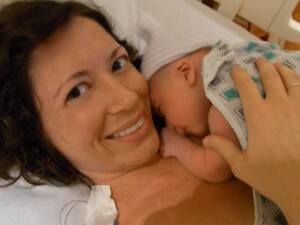 Here I was with a new baby, and all I could think about was why I felt like I was slowly going paralyzed. Every time I sat down, my lower back would pulsate in excruciating pain that would begin in my spine and wrap around to my abdomen. My legs felt like jelly, as though they would collapse under me at any moment. I felt strange muscle twitches and an electric-like buzzing, pins-and-needles sensation in my legs. I could barely walk around the block. It was the first time in my life that I truly wanted to die. With the neuropathy spreading to my arms, I wound up in the emergency room twice during my baby’s first few days on earth. During that precious time that most new mothers spend bonding with their newborns, I was in the ER pumping breast milk to feed my baby who was being cared for by my husband and mom at home. It broke my heart that I could barely hold him, let alone bond with him during this time. I was told that my problems could not be from the epidural, as all tests and MRI’s came back normal, and I was sent home. Oh my God, I thought. How could I be fine one day, go in to give birth the next, and come out like this?! How could it NOT be from the epidural? No one wanted to talk about the elephant in the room. Weeks passed. I desperately sought the opinion of several other neurologists, all of whom avoided discussing the epidural and, after running numerous blood tests that came back normal, dismissed my symptoms as psychosomatic; a result of postpartum depression and anxiety. I was prescribed anti-depressants and sent home again and again with no mention of the epidural. Months passed. Every day was filled with pain, weakness, and bizarre neuropathic symptoms. Burning pain one minute, ice-cold sensations the next, worms crawling under my skin, muscle spasms like a human popcorn machine. I continued to beg God to take me. Meanwhile, I had a baby to care for. I was a mother. I put on a fake smile for months, as I did not want my baby to sense my pain and agony. I relied on my husband to hold the household together. My rock, he did all of the chores and cooked all of the dinners. I owe him a lot. Every day, I used every ounce of my energy to care for my baby, using nap times to obsessively search the Internet for answers. I finally came across a page that described my symptoms perfectly. The disease was called adhesive arachnoiditis. A book had been written about it called “The Silent Epidemic,” since many doctors fail to diagnose it out of ignorance or fear, hence the code of silence. I found the author of this book, Dr. Antonio Aldrete, one of the world’s premier experts on the disease, and sent my medical records and MRI’s to him for review. Shortly thereafter, he confirmed the diagnosis of adhesive arachnoiditis over the phone. Nerve root clumping was evident on my MRI’s. I was both devastated and relieved. Finally, I knew what was wrong with me. I was NOT crazy or anxious or just another postpartum depression case. Then, I was angry. How did the other doctors miss this for so long? Do they not know what it is? Are they hiding it from me? I have since gone through many treatments for my pain, and I live one day at a time. Because the disease is iatrogenic,(induced inadvertently by a physician or surgeon) little research has been done on arachnoiditis, so there is no specific treatment protocol. The medications I take are largely experimental in nature. It has been difficult adjusting to life with a spinal disorder. A former avid runner and assistant cross country coach, I now cannot stand or sit for long periods of time without terrible pain. I rely on medications 24/7 in order to function and maintain moderately low pain levels. Unless a cure is discovered, I will likely depend on them for the rest of my life. Needless to say, the physical challenges are met with equally difficult emotional and social ones. For example, others often mistake me for a healthy person or even a drug seeker, since I look normal on the outside. This can be very humiliating to the afflicted person, and it can be frustrating to friends who can’t understand why you keep canceling plans at the last minute because you’re having a bad pain day. Just like anyone else, I have fears. Aside from the prospect of my disease progressing, one of my biggest fears is that I will no longer be able to work to help support my family, or that I won’t be able to have another child because of this illness or the meds I have to take. I don’t know if I can go without my meds, or how my spine can support the weight of pregnancy. What do I want? I want doctors to listen to their patients and honor the oath they took before entering their practices to “first, do no harm.” I want OB’s to stop ordering unnecessary interventions, and to respect the natural process of birthing as much as possible. I want true informed consent well in advance of the procedure when the patient is in his/her right mind, and I want it to be more thorough to cover ALL risks, even if they are deemed “rare,” as many complications resulting from medical procedures are, in reality, not as rare as many medical professionals would have us believe. In the case of arachnoiditis, since there conveniently exists no reliable system or governing body to report and monitor its occurrence, it is impossible to know how many sufferers are truly out there. What has become clear is the fact that social media support groups are teeming with a staggering number of arachnoiditis patients, many of whom have suffered for years before finally getting an honest diagnosis. Their stories have yet to be heard and acknowledged by the medical community at large. It is a disease that has been widely misdiagnosed, underreported, and/or mislabeled as “failed back surgery syndrome” or fibromyalgia, among many other disorders. It is shocking how many doctors – the very doctors who administer spinal procedures – have never even heard of arachnoiditis. And it is sad to think how many people are out there who are wondering what is wrong with them, not to mention how many new mothers with legitimate medical problems are conveniently written off as postpartum depression head cases. Originally published in the National Pain Report, Michelle submitted her story for use at the Art For Arachnoiditis Project. With Reasonable Accommodations offered in her workplace, Michelle was eventually able to return to teaching. Epidurals and spinal injections for surgical anesthesia and pain management are a known cause of Spinal Adhesive Arachnoiditis and Caude Equina Syndrome. Find out more about the Risks of Spinal Injections and the Value of Informed Consent. Have you had any additional unexpected and/or unexplained medical after receiving a spinal injection? You are welcome to share your story in the the comments below.